It takes a long time for mail to get here sometimes. This last week I received bunches of Christmas and holiday cards, most of which had been sent long before the holidays. Among them was a card from Sugi and Andy containing a CD of the final batch of photos from our trip to visit them in Taipei. Included in it was this great shot. We were at the Tamshui Fisherman’s Wharf on a wet, cold and blustery day. 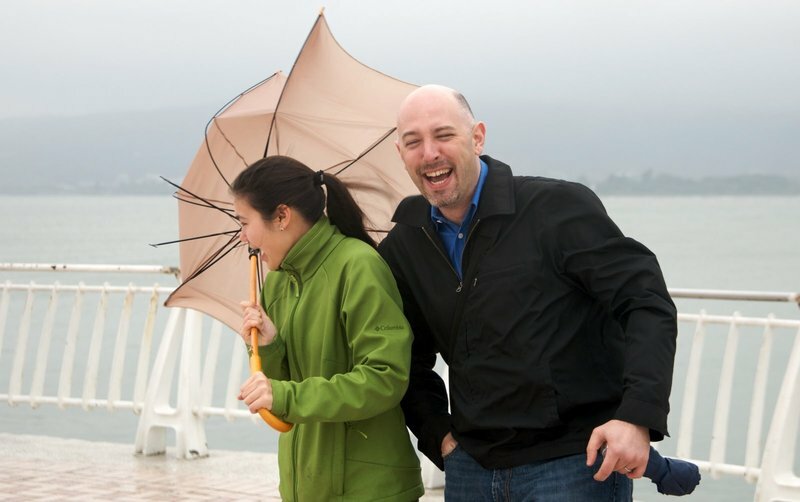 As Sugi and I posed for a picture the wind got the better of her and her umbrella. Needless to say, the umbrella was destroyed. But we enjoyed a good laugh, which is really the point, right? This entry was posted in Uncategorized and tagged Chris, Sugi, Taipei, Wind by christao408. Bookmark the permalink. Your enjoyment really showed. Laugh and all. Thanks for updating us. Great shot. I remember when Andy (I think) posted it originally last year. I too lost my umbrella there. Turns out that when I got back to Taipei, I ended up getting one of my favorite umbrellas, which I would never have gotten had my original umbrella not snapped here.How long would you say it takes for mail from the US to get to you? I actually really like that picture! It captures a moment. That sure was a priceless moment. :)Yeah how long did it take to get there?! Perfect picture… I love it! I love it. What a naturally perfect picture. Photo did capture the right moment! Good one too! And your umbrella was perfectly stowed and safe from the winds. I could almost feel the winds on my face looking at this picture. I love this picture!!! It’s so natural and perfect! Love the pic. It captures the moment. I nominate this as the best pic that I’ve ever seen of you Chris! Very au natural. Such joie de vivre…great natural picture. Thanks for sharing it. @jandsschultz – @iskrak – @Wangium – @marc11864 – @epiginoskete – @TheCheshireGrins – @Dezinerdreams – @CurryPuffy – @ZSA_MD – @ElusiveWords – @Roadlesstaken – @Redlegsix – @Norcani – Thanks for your comments. Of course all the credit goes to Andy who was shooting away, perfectly focused and unconcerned that his girlfriend was about to get blown away in a gale! =D@doiturselfer – Yes, where the umbrella should be! @arenadi – @yang1815 – Timing from the US is a bit of a mystery. Much of the mail over the holidays seems to have taken three weeks or more. Usually it is within two. Sometimes, though, everything clicks and it takes less than a week. Going back from Thailand it is almos always two weeks. @christao408 – Wow… Mail to Taipei is within a week! @christao408 – Haha, of course Andy got the shot. He’s a photographer, the shot is the #1 thing. MUST GET THE SHOT! !I think if he were falling off a cliff, he’d have one hand on the edge of the cliff and one hand on his shutter release taking pictures thinking WOW this shot is going to be awesome!Its like when I accidentally stabbed myself while shucking oysters with a knife, first thing I thought was “where’s my camera? ?” haha. A beautiful photo! Great feeling of fun oozes from this! @yang1815 – Mail to Taipei is probably nonstop. Except on flight from LAX, there are no nonstops to BKK. @murisopsis – Doesn’t it, though? @arenadi – You know, yesterday I was flying back up from Singapore and was thinking about the emergency landing the UA plane made in Newark the other day. I asked myself, “What would be the safest way to brace myself and shoot video during an emergency landing?” Terrible, huh?